Heat oven to 400°F. Line 2 large cookie sheets with cooking parchment paper. On floured work surface, unroll pie crust. Using 1 3/4-inch round cookie or canapé cutter, cut out 32 rounds; place about 1/2 inch apart on cookie sheets. Spread about 1 teaspoon goat cheese on each dough round. Bake 10 to 12 minutes or until edges are light golden brown. Meanwhile, in medium bowl, stir together chopped roasted peppers, finely chopped oregano, oil and garlic powder until well blended. 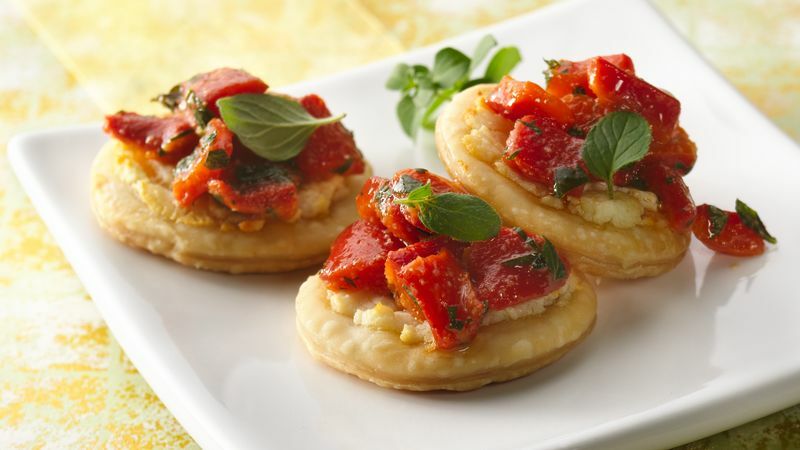 Immediately top each baked cheese-topped round with 1 teaspoon red pepper mixture; place on serving platter. Garnish each with oregano leaf. Serve warm or at room temperature. Be sure to store goat cheese in the refrigerator, tightly wrapped in plastic and away from eggs, butter and other foods that might easily pick up flavors. Look for cooking parchment paper with the other paper products at the supermarket. It's great for making cookies and other items—clean up is extra easy!